This one is mine. Part of mine. Probably the part I use most often. 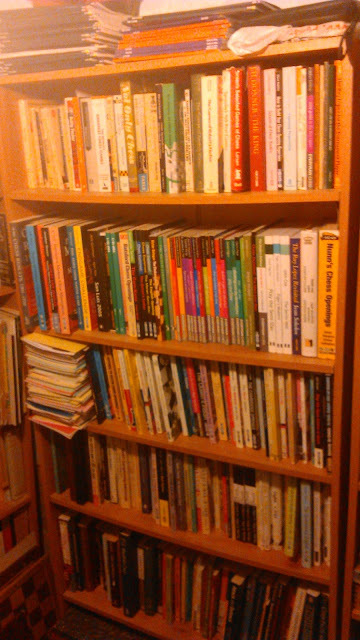 and here's roughly the other half, excluding the Rough Guides at the top and the books, nothing to do with chess, mostly out of shot at the bottom. 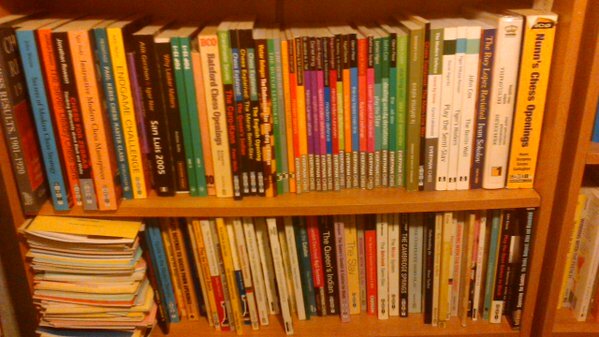 Probably many readers have much larger collections, if you'd call them that: it makes them sound more coherent, both in the way they were acquired and the way they're organised, than they usually are. Speaking entirely rationally, I should probably have got rid of most of mine years ago. But that's something I don't do: I don't get rid of books. Not any books, not even chess books. Not the ropey old Trends pamphlets from the Eighties. Not the Eric Schiller books, either the books he put his name to or the ones he largely wrote. Not the water-damaged books, not the mangled book that was stuffed by a drunken postman into a mailbox it didn't fit. Not the books copied up by Ray (with or without Dominic Lawson) from stuff he'd written before. Not the Little Book Of Chess Plagiarism (visible in one of the shots). Not the ninety per cent of them which one could "open at page one and then immediately close again for ever". Not the books about endings that I should have read and haven't, not the books about openings that I've never played or played just once or haven't played for decades. The only ones that I ever throw away are the ones that have fallen apart, as books (and their readers) do with age and overuse. I remember losing a book on the Najdorf to disintegration, possibly due to my reading through the game Gheorghiu-Polugaevsky too many times. (I can remember that. Oddly, I can't remember who wrote the book.) But that's barely a handful. Other than those, everything is still here, from More Chess For Children (whatever happened to my Chess For Children?) onwards. I guess that in some respects, this is a bit like people who insist on keeping their vinyl collection, using up half their house to keep it in when, if they wanted, they could carry it around with them all day without noticing the burden. Not quite, perhaps - chess books are not so easily replaced. But I could offload lots of them. I'm sure more then three quarters of my books are never opened and probably never will be again. Some of them have never been opened at all. But I keep them, just like I keep all of my other books. I keep them because I'm a bookseller and a librarian. I keep them because that way, my house is full of books - and a house should be full of books. 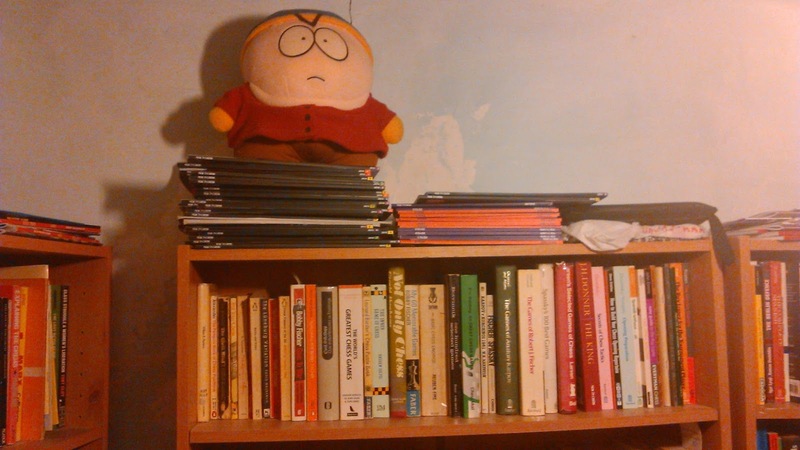 And I keep them because what I've done with life is accumulate books - and there they are for everyone to see. 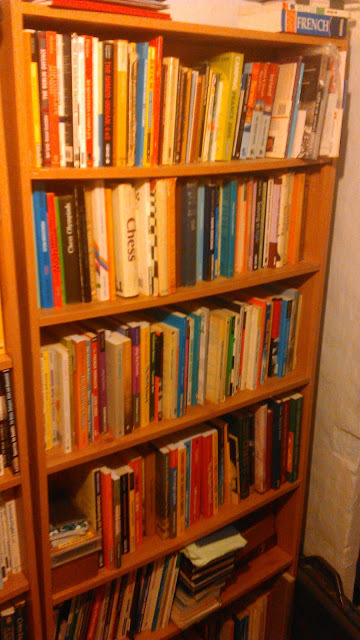 Here is my life, in bookshelves. This here part is my life in chess. And however foolish or otherwise it may have been, what you see is what it is. One reason I like the books on my shelf is that at a glance I can remember what's in the book. The physical design of the book and its location on the shelf help me recall its existence, and every time I walk by the bookshelf I have a chance to look at some book titles and re-situate myself. It's all engaging a visual and spatial part of my memory that isn't activated by a list on a computer. You know that Bott and Morrison were members of S and B CC back in the day? One of my first books too. It's got to the point where I'm surprised to learn that any given player hasn't been a member.